A new Swiss-based blockchain startup, Havuta, is intent on disrupting the development sector by empowering NGOs with access to more, better, and longer-term data. A significant area of impact assessment weakness for development actors is their lack of access to, and minimal capacity to obtain, ‘tracer data’. According to the International Labour Organization, a tracer study is a study that “explores what changes occurred in the lives of former beneficiaries, and if and how the intervention contributed to these changes”. Many NGOs are unable to prove the long-term impact of their intervention efforts after their programs have concluded. This is because tracking the progress of the beneficiaries of their projects is expensive, time-consuming, raises ethical questions, and is lacking in transparency. Havuta has created a blockchain-based solution to the tracer data problem, called The TracR Project. The Havuta blockchain, fueled by HIE tokens, helps NGOs gather tracer data from their beneficiaries over longer time horizons, enabling them to measure the impact their interventions have over the long-term. This means they are able to update and improve their programs to be more effective in the long-run and achieve their goals by receiving data from the community level, transparently, and without human bias. In turn, donors are able to determine the impact the NGOs they support are having. For example, Technical and Vocational Education and Training (TVET) institutions can trace the progress of their alumni to collect information on their careers and assess the impact of their education programs. NGOs whose data collection practices are limited to baseline (before the intervention) and post-intervention surveys (taken immediately following the conclusion of the program) will be able to deploy Havuta to get a bigger and better picture of the real, long-term impact of their intervention. Havuta makes tracking down or locating beneficiaries virtually costless. NGOs are able to onboard their beneficiaries at the beginning or conclusion of a program and use Havuta’s push notification capabilities to survey their former beneficiaries. As illustrations, this solution will prove enormously beneficial for training institutions, short-term sanitation training delivery, and NGOs involved in combating child labor (provided ethical research practices are employed and a parent or guardian is responsible for providing updates on the progress of beneficiaries where children are concerned). Havuta’s TracR Project is an elegant, efficient, and simple way of gathering data long after the conclusion of a program, informing development actors of their actual impact on beneficiaries’ lives in ways that are largely cost prohibitive under current practice. By accumulating data on their alumni, general education and TVET institutions and their donors can get a clear picture of the quality of their programs, the skills their recipients need, their graduates’ contribution to the local economy, and the certainty of their contribution to the UN’s Sustainable Development Goal 4: Ensure inclusive and equitable quality education and promote lifelong learning opportunities for all. TVET institutions need to receive on-the-ground feedback from the communities they serve as to the effectiveness of their programs and any aspects they may need to tweak. That type of research is typically difficult and expensive to obtain. Many TVET providers can do little more than make educated guesses about what types of training programs may work best for their stakeholders. With direct feedback from those stakeholders, they will be nimbly able to adjust and respond to actual–rather than perceived or assumed–vocational needs. TVET projects rely on an “analysis of the vocational needs and the socio-educational-economic characteristics of the target populations; the analysis of the skills required by the markets; the development (or adaptation) of curricula…”. According to EuropeAid’s “TVET and Skills Development in EU Development Cooperation” 2012 report, it was not possible to assess the impact of 11 ongoing projects out of 22. For those for which impact assessments were possible, only 36% were judged as ‘satisfactory’. The same project reported that “the main difficulty encountered was the assessment of effectiveness, efficiency, and impact of multiple country projects.” Without adequate data on a program’s effectiveness and impact, it is practically impossible to design a program that is perfectly tailored to the community’s needs. And in the case of the delivery of TVET programs, adequate data must include tracer data. 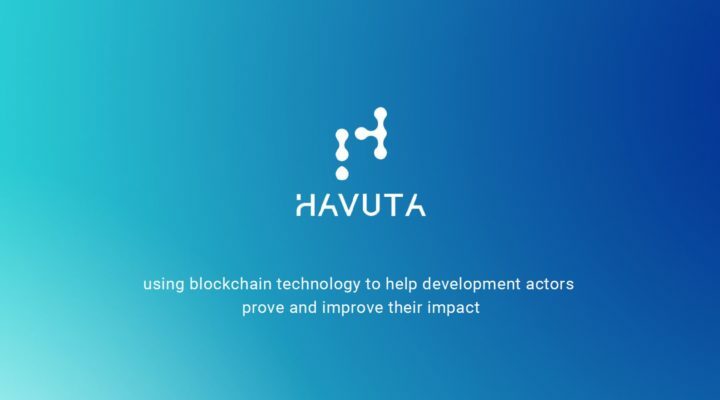 Havuta’s deployment of blockchain technology and surging smartphone penetration in the developing world promises to bring data to where it is needed most, affordably, reliably, and immutably.